I can't say enough wonderful things about this salad dish. It's healthy, it's beautiful, it's delicious. There's a little bit of everything from each of the four seasons. The smoked salmon reminds me of cold winters in Alaska, the avocados remind me of summers in San Diego, the pepitas and pomegranite seeds are signs of fall, and the spring mix salad greens tie it all together. But the star of this show? The star of the show here is the ruby red grapefruit. Grapefruit is a rich source of vitamin C, and the pink and red hues contain the beneficial antioxidant lycopene. Studies have shown grapefruit helps lower cholesterol, and there is evidence that the seeds have antioxidant properties. * Today, I'm using the Ruby Red grapefruit, often considered to be one of the most sought after varities, with its sweet, acidic flavor and beautiful, dark red color. This salad only takes about 15 minutes to make and is a GREAT start to any healthy meal. It's great with a light, fresh Riesling wine! Section the grapefruit by cutting off the top and bottom, then slicing next to the inner endocarp (edible fruit section), removing all the white pith around the edges. Next, slice inbetween the white membrane sections, removing ONLY the edible fruit sections. Transfer to a bowl and set aside. Peel, seed and slice the avocados into 1/2 inch slices, set aside. Roll the salmon slices into 1" rolls, set aside. 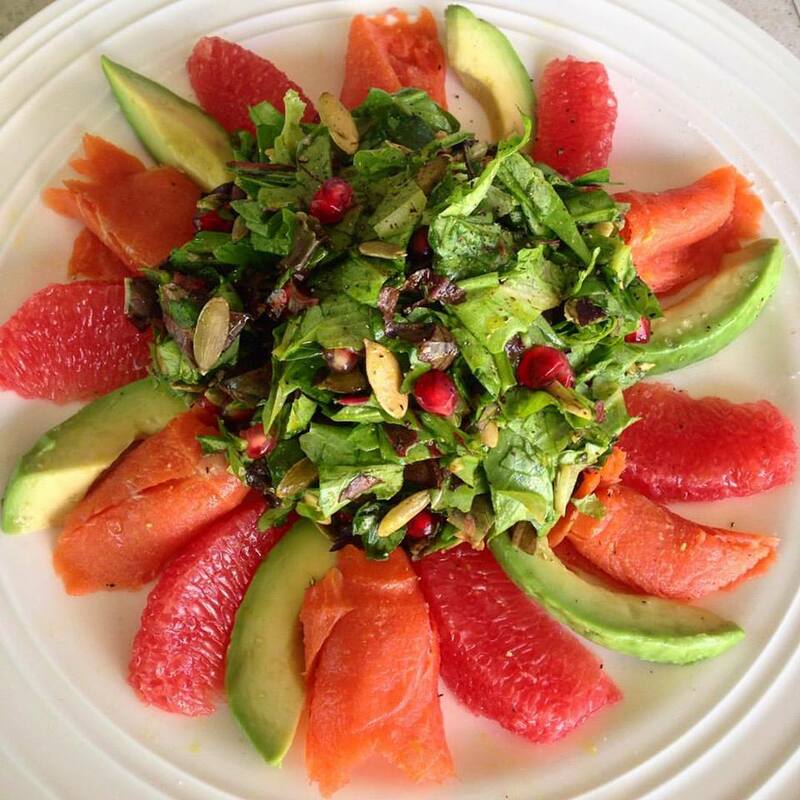 Arrange the slices of the avocado, grapefruit and salmon onto a large serving dish around the edges of the plate. In a separate mixing bowl add the chopped spring mix, pomegranate seeds and pepitas. Toss to combine. In a separate small bowl, combine the mustard, agave nectar, garlic powder, salt and pepper. Whisk to combine and add to the salad mixture. Toss the salad and dressing together until combined. 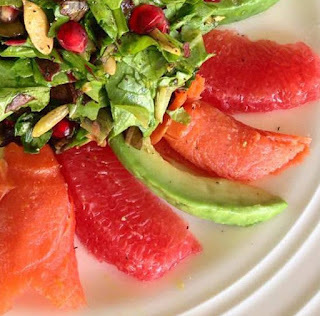 Place the salad into the center of the serving dish with the salmon, avocado and grapefruit. Garnish with a light dusting of salt and pepper. Serve immediately. This salad looks yummy! And I love how many healthy ingredients are included in the recipe. I think this salad would fit into the diet plan my nutritionist made for me really well. She has an interesting webinar series streaming right now that talks about eating frequent small meals and snacks to curb hunger and increase energy. It's worth viewing. Here's the link: http://sheismynutritionist.com/.